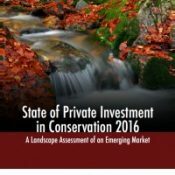 Conservation investing is on the rise and experienced dramatic growth after 2013 as total committed private capital climbed from $5 billion to just over $8 billion, according to Ecosystem Marketplace’s latest report, State of Private Investment in Conservation 2016. It’s recognition of forests, wetlands and reefs as smart investments, authors say, and signals growing interest among even mainstream investors. 11 January 2017 | The private sector channeled $8.2 billion (B) of private capital into investments that seek measurable environmental benefits – in addition to financial returns – between 2004 and 2015 according to a report released today by Forest Trends’ Ecosystem Marketplace. The report, which builds upon the 2014 report Investing in Conservation: A landscape assessment of an emerging market, 1 tracks the burgeoning field of “conservation investing” – a component of socially and environmentally conscious “impact investing.” By the report’s definition, these conservation investments include any private capital committed for sustainable food and fiber production, habitat protection, or clean water that aim to achieve environmental conservation objectives while also delivering a financial return. Conservation investing experienced dramatic growth after 2013, as total committed private capital climbed 62%2 in just two years from $5.1B to $8.2B. Investments in sustainable food and fiber led the way, accounting for $6.5B in private capital committed during the decade covered by the report. Another $1.3B went to habitat conservation, while investments in improving water quality or quantity totaled $400 million (M). Investors have confidence in stable returns, as 31% of all investors surveyed by Ecosystem Marketplace anticipate rates of return between 5% and 9.9%. Among for-profit respondents, half expect returns of 10% or more, suggesting that conservation-oriented investments are performing well when compared with traditional strategies. Over $3B in additional private capital remained on the table in 2015 as investors continued to seek out deals that met criteria for both environmental and financial returns. A majority of respondents identified a lack of deals with the right mix of risk and returns as the biggest obstacle to the future growth of conservation investing. Still, almost all of these investors said they planned to raise or reallocate more capital for these investments in the next three years than they had in the previous three. Private capital is beginning to reach emerging markets. While the vast majority of investments in habitat and water conservation remained concentrated in North America, private finance for sustainable food and fiber production was more evenly dispersed between North America (33%), Latin America (29%), Oceania (19%), and Africa and Asia (about 9% each). The growing confidence in stable returns from conservation-oriented investments, which would have been almost inconceivable a decade ago, points to a new wave of investable conservation efforts – including sustainable forestry, agriculture, fisheries, habitat, and water – that are emerging in response to demand from impact investors. The report signals a newfound awareness on the part of banks, fund managers, and others that these emerging asset classes, once considered a novelty, now represent a sensible addition to portfolios. The report drew on survey responses from 128 banks, companies, fund managers, family offices, and non-governmental organizations, most of which were headquartered in North America and Europe. However, the report found that a significant amount of investment is moving into emerging economies, particularly sustainable forestry in Latin America – where annual investments quadrupled to over $500M between 2009 and 2015 – and Africa. “JPMorgan Chase provided founding support for NatureVest, The Nature Conservancy’s conservation investing unit, to help spur exactly this kind of market development and analysis. Our clients are looking for these opportunities, and we are learning from and are encouraged by the innovation and measurable market growth documented in this Ecosystem Marketplace report.” said Camilla Seth, Executive Director of Sustainable Finance at JPMorgan Chase & Co. and Advisory Committee Chair for the report.